Hello Friends, it’s good to see you again! I hope you are doing well. 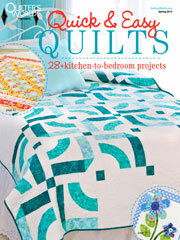 Today I am happy to share with you my “Monkey Around” quilt that is featured in Quilter’s World‘s April 2013 issue. The blocks are pieced from border stripe fabric, extending the use of stripe fabric beyond merely sashing and borders! See how these cute monkeys major in playfulness. The fabrics I used to make this quilt should look familiar to you because I have designed two other quilts using the same fabrics. I will show you the other designs later on in this post. 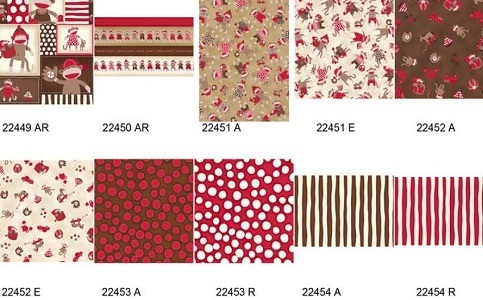 The fabrics are from Quilting Treasures‘ Monkey Around collection. Quilting was done with Aurifil Mako 50 Cotton thread over Hobbs Tuscany Silk batt. Quilting was simple because I wanted these fabulous fabrics to be the focus of the quilt. 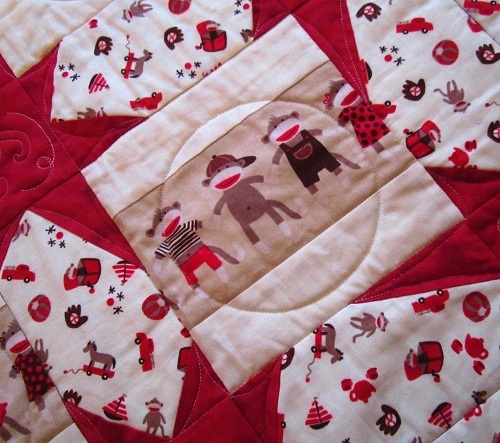 I quilted circles on the pieced blocks to highlight the monkeys. 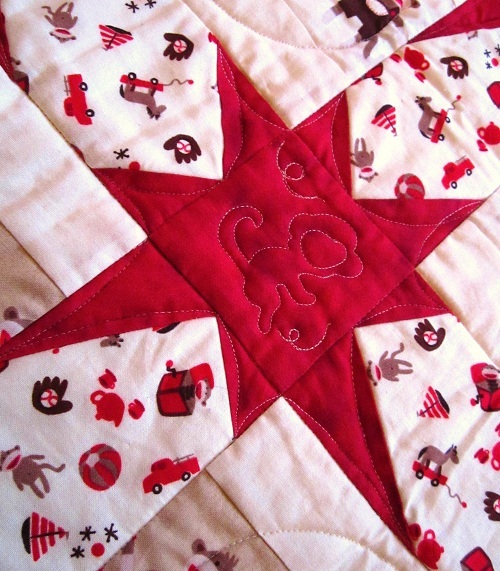 I then quilted tumbling monkeys on some of the star blocks to add another dimension of playfulness! 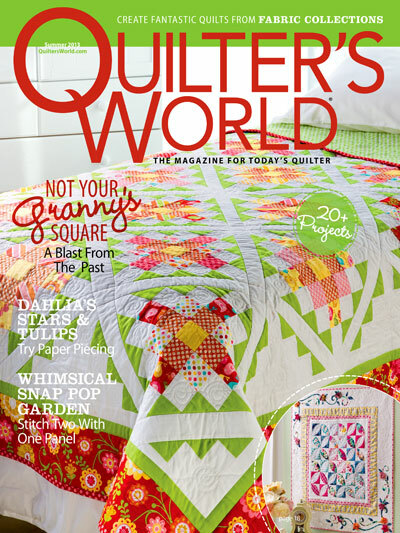 I hope you liked my “Monkey Around” quilt in Quilter’s World. As I said earlier, I had actually designed two other quilts using the same fabrics. 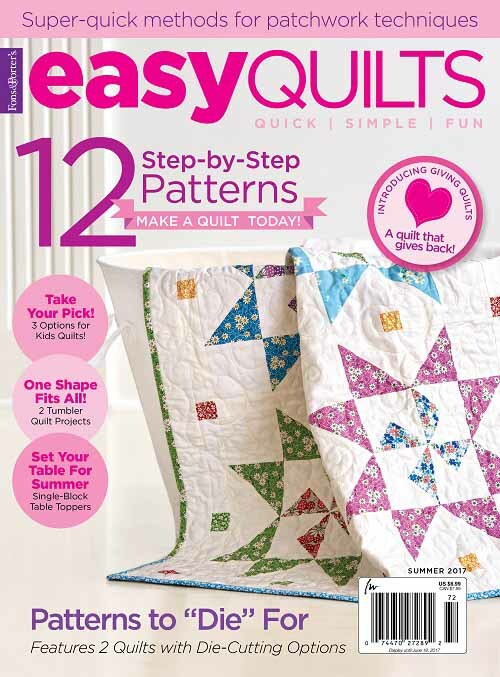 These patterns are offered for free via Quilting Treasures. Click here and here to access the free downloadable pattern instructions in pdf format. 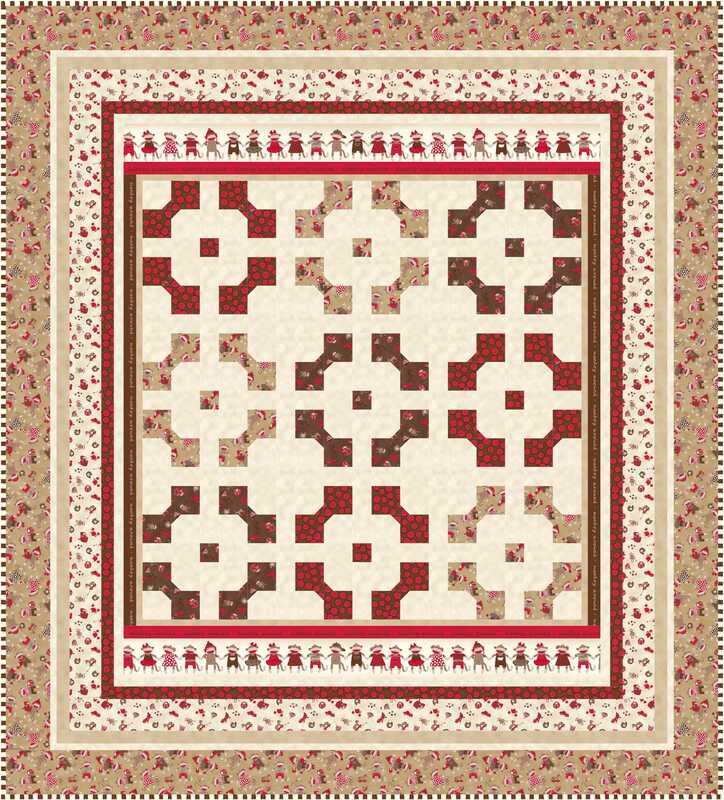 Do you have a favorite among the three Monkey Around quilts? Thanks for stopping by. I hope you have a lovely weekend. I have had a very stressful week this week in the work department. My posting schedule should be back to normal next week. You all take care! 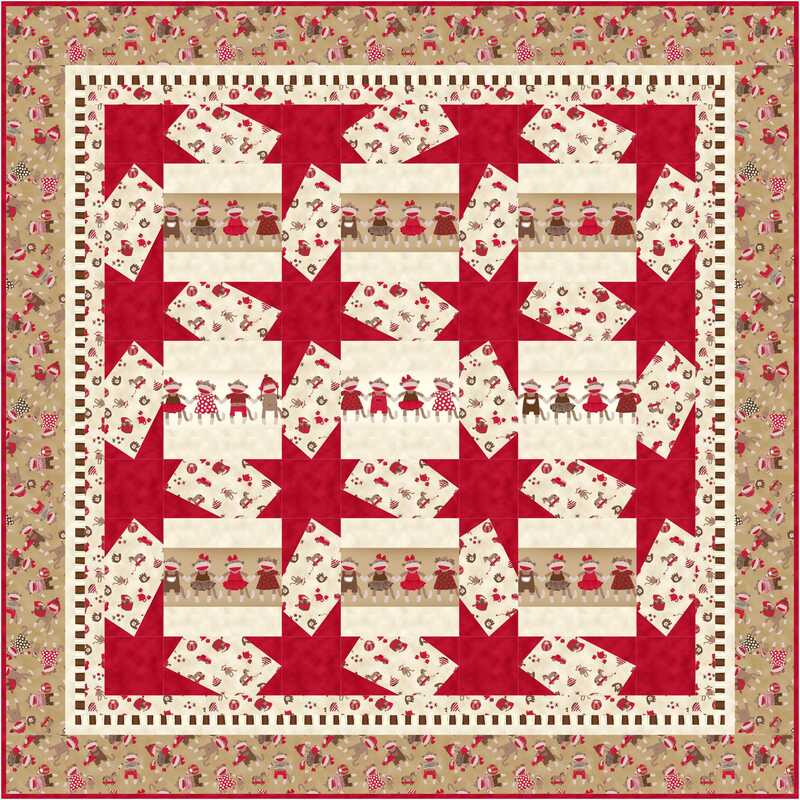 This entry was posted in Quilt kit, Quilt Pattern, Quilting, Quilts & Projects: Published, Quilts: Pieced and tagged Quilter's World April 2013, Quilting Treasures Monkey Around, Sock Monkey Quilt, Wendy Sheppard Designs. Bookmark the permalink. 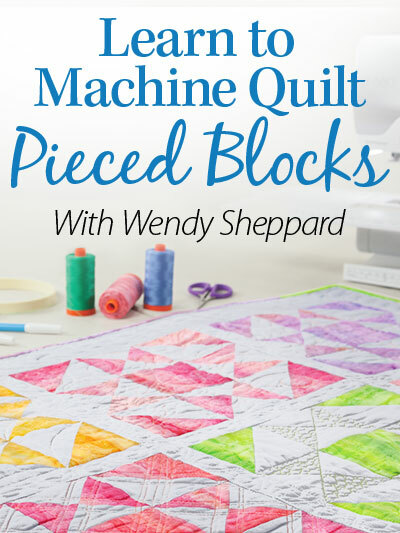 I was wondering if the circles you quilted in the monkey blocks were done free hand or if you used a ruler or template. I wish I could order this kit but I have (a) spent my fabric budget for this month and (b) would definitely get done by the Brits for this. It isn’t the tax @ 20% I object to it’s the £8.00 handling fee for charging me the tax that I strongly object to. But for this kit I would say pay it so if it’s sitll available next month one of these will be mine. My younger grandson would just love it. That is darling. I had one of these monkeys as a child — I think it may still be in a storage box somewhere. I love the little quilted monkey outlines, too. Seriously CUTE! Your quilts never fail to lift my spirits and make me smile. Thank you for the free patterns. Now that is way too cute! Makes me want to get up and dance. Sorry about the Anonymous….it’s me….BillieBee….oh no that rhymed…I better stop now. Have a great weekend Wendy. 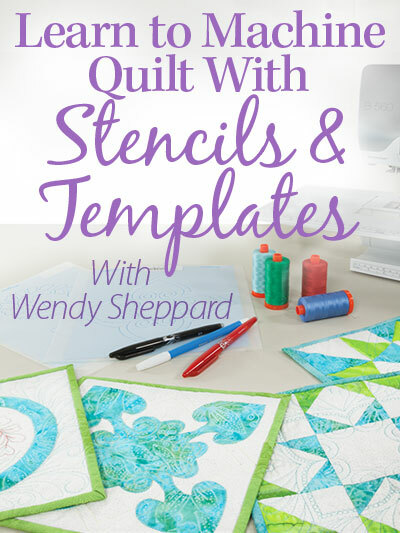 What a great method for quilting the circles!!!! Thanks so much for sharing…..I always look forward to your post. Your quilting is beautiful and inspiring. This is an amazing quilt!! Sock Monkeys have never gone out of style. What a great quilt for little ones of all ages. Love the free motion monkeys!! Have a geat weekend, Wendy! How adorable! And just when I thought nothing could get any cuter than “Now I Know My ABC’s” !!! What a creative mind you have. This is so much fun Wendy! 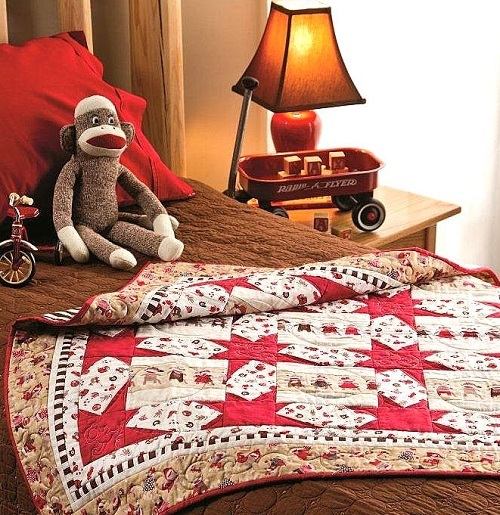 Love the monkey quilt! Lovely post Wendy – I love the way you have designed this one. Wendy, thanks for the patterns. I particularly like the one made with the bow tie block. Will definitely make it. Of course, those quilted feathers got me. I don’t know what I would do w/o freezer paper!! Love the little sock monkeys (and especially the “star” monkey!!!). 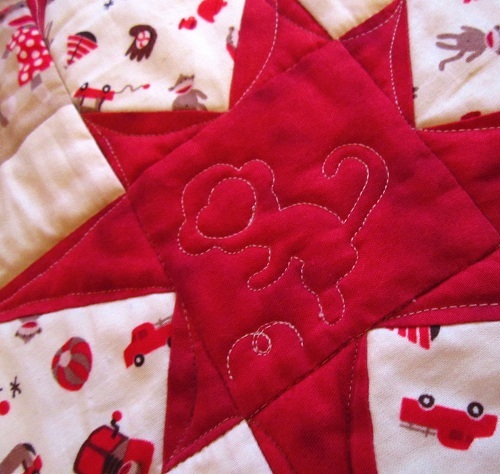 The monkey fabric quilt is just so cute!! 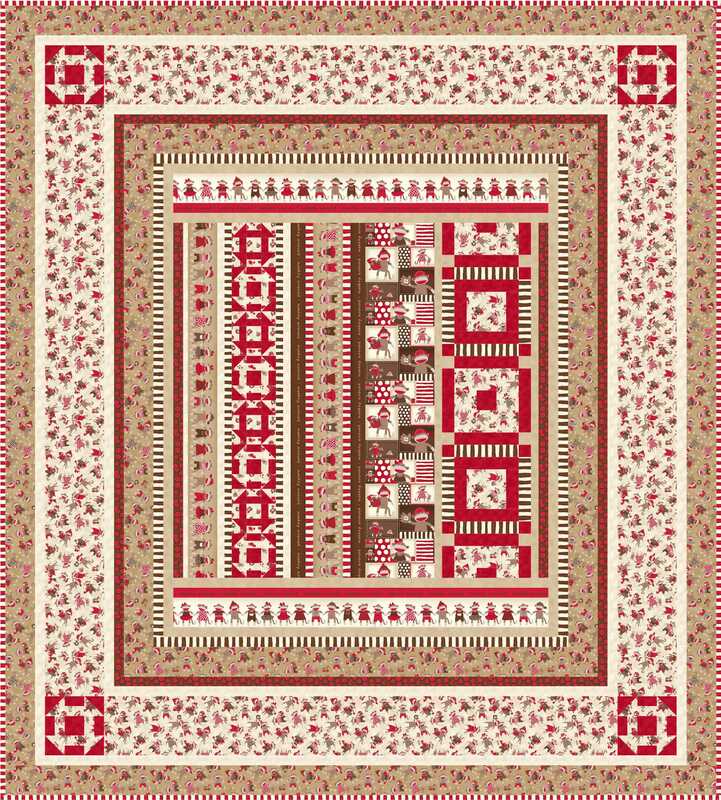 I love this latest Monkey quilt the best! 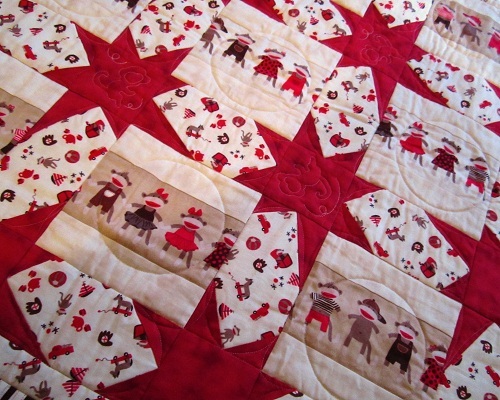 Love the wonky stars and the way you’ve used the monkey fabric! 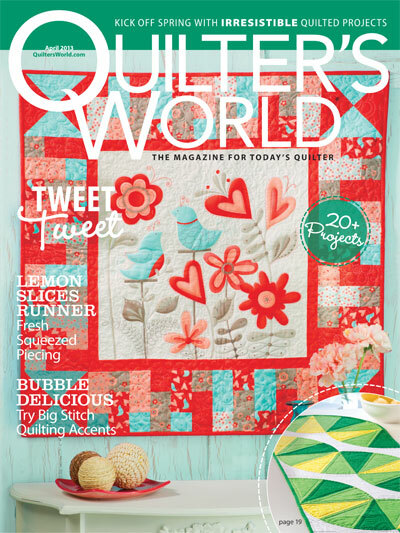 I was so excited when I got your email about it that I went to the Quilter’s World site to see when the new issue would be out and the digital issue was available now. I hadn’t gotten the email notice of it yet but went ahead and downloaded it. I’m so glad the pattern is in it but was disappointed that there wasn’t a template for the little monkey quilting design in it. But I think by downloading the pics you have here, I could use them as a guide. Someone mentioned a kit….is one available for this one yet and, if so, where is it? I love your work and have saved all your Thread Talks and everything else I can from your site!! 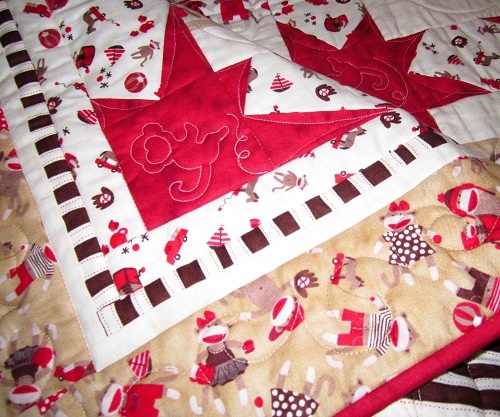 You really made the monkey a “star” in this quilt! the quilted mondky and the quilt itself are adorable. I like all 3 quilts but like the star quilt just a little bit more. Love those wonky stars!! Great quilt! 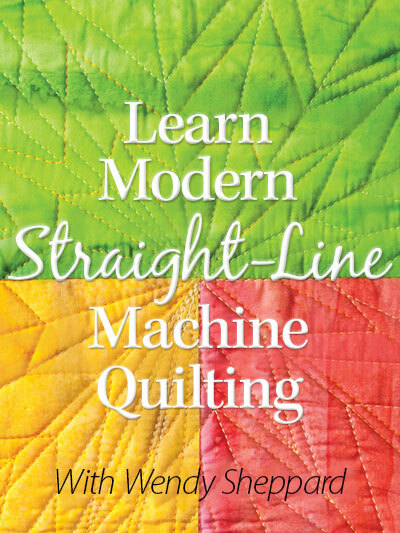 Also, received my Machine Quilting mag yesterday…great article on your feathers! Congrats! This is adorable, Wendy! 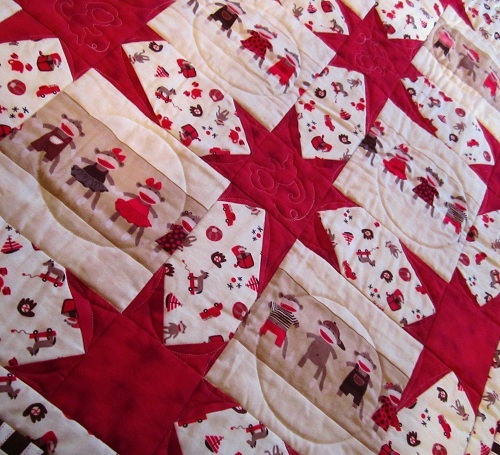 I love how you quilted little monkeys on your wonky stars to omplement the fabric. Perfect!